Learning how to make leftover ham recipes can give you many economical meals. Hopefully, these recipes were on your mind when cooking your Easter ham. 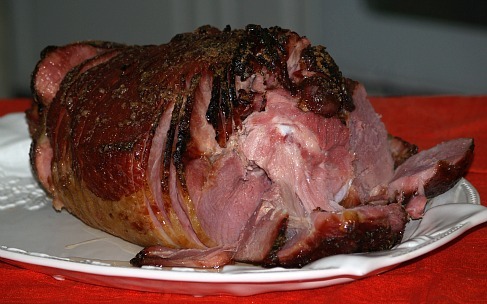 If you are like many of us who cook a big ham on Easter, you have much of it left for leftover recipes. When cleaning up the dinner dishes, these leftovers should have been stored also. It makes things much easier if you had planned ahead for your ham recipes and wrapped accordingly. Casseroles usually serve six to eight people so 1 ½ pounds of meat should be packaged individually. If serving ham alone, allow three to four ounces per person. If packaged properly, this meat will stay good in the freezer for a few months. I usually wrap it tightly in plastic wrap, then in foil wrap to prevent freezer burn. I then put it all in a plastic bag so it doesn’t get overlooked in the freezer. One thing we do not want to do is waste any good food. It is too expensive! I learned how to make leftover ham recipes for the first time when I made a big pot of beans with the ham bone. This time is was black beans. For less than $2.00 I purchased a large bag of dried black beans. Try buying the canned black beans; you will not get many for $2.00 and they won’t taste as good either. After soaking overnight in cold water, it became a large kettle of beans. I consider this the only method to use. Not only does the soaking make them faster to cook but I think it makes them taste better. This is my opinion! After draining the water off, I rinsed the beans with clear water. I then put the ham bone in the kettle with the beans, a medium chopped onion, salt and pepper and cover all with fresh cold water. Sometimes I will chop green bell pepper in them also. Bring the mixture to a boil, reduce heat to low and simmer until beans are very tender. My bag of dry beans produced 16 cups of cooked beans. My favorite way to serve is black beans and rice. This is one of the most economical of all the leftover ham recipes. It is very filling and you get protein with the beans and rice. It also can make a nice presentation. I place a layer of rice on the plate in a nice even circle. Top the rice with a nice even layer of black beans, showing an outer ring of the rice. Top the beans with shredded cheddar cheese and chopped onion. (If you are serving company, serve the chopped onion on the side). Add a small green salad and you have a great lunch. By the way, divide leftover beans in small containers and freeze them. This is how you can have future meals ready at your fingertips. Just remember to mark what is in each container and don’t forget to use them. You might even make a list as to what you have in your freezer. If you learn how to make leftover ham recipes the combinations are endless. This meat can be used served for breakfast with fried eggs, cut up in scrambled eggs, in quiches or in numerous other ways. For lunch the leftovers can be used in soups, stews or chopped on many of the salads. The casseroles are great for dinner. Add the ham to potatoes, rice or noodles and have a delicious dish. Add a small salad, maybe a little fruit and you will have a well balanced meal to please any family. The following from my leftover ham recipes is very delicious. The flavors blended in this dish with sour cream added is great! 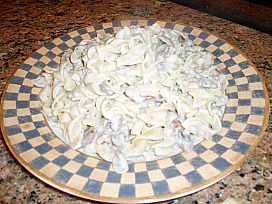 Most of the time I make homemade egg noodles which are wonderful in this recipe. In a large skillet melt the butter. Add the onion, green pepper, celery and sauté until vegetables are tender. Add the mushroom; stir in the milk, soup and Worcestershire sauce. Blend in the sour cream. Stir over low heat for five minutes. Add the diced ham and stir over heat for a few more minutes. Blend the cream mixture with the cooked noodles and serve immediately. Melt butter in a large skillet over moderate heat. Add the eggs and cook until they are slightly set. Stir eggs and cook for a couple more minutes. Remove pan from heat and move eggs to a plate. Break apart with a fork and set aside. Add sesame oil to the pan and move back onto the heat. Add the cooked rice, beans, ham and pepper. Cook, stirring constantly for a couple of minutes. Reduce heat to low and add the eggs, green onions, mushrooms and soy sauce. Stir mixture until hot and serve immediately. 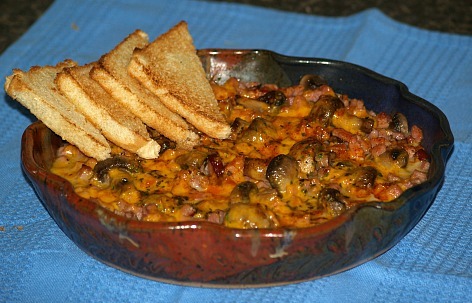 Melt ¼ cup of the butter in a large skillet; add mushrooms and sauté until softened about 5 minutes. Add ham to skillet; cook until hot about 2 minutes. Stir in wine and bring to a boil about 1 minute; reduce heat and stir in the cream about 2 minutes. Spoon mixture into a shallow heat and flameproof dish; sprinkle cheese over the top. Garnish with parsley and set aside while preparing toast. TO MAKE TOAST trim crust off of bread slices. Blend remaining butter with Italian seasoning. Spread on both sides of bread; broil both sides of bread until toasted. Cut each slice in half and serve with mushrooms and ham recipe.